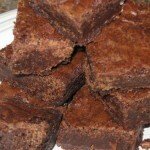 Another brownie recipe. 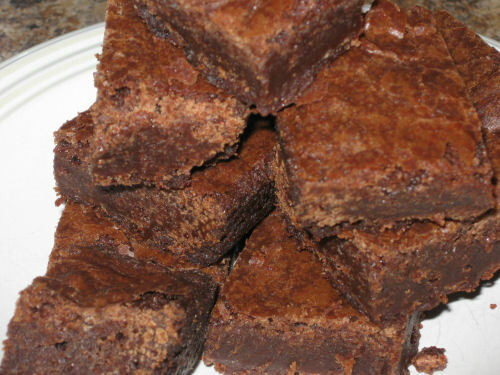 Another PERFECT brownie recipe. Preheat oven to 325 degrees. Lightly grease an 8 x 8 pan. In a medium sized pot melt the butter & chocolate over a low heat, stirring frequently with a wooden spoon; remove pan from heat and stir in the sugar. Add the beaten eggs & vanilla – stir until smooth. Add the flour and stir only until it is incorporated. Pour batter into the pan and bake for about 60 – 70 minutes; when a knife or toothpick inserted into center comes out clean. Let these brownies cool for at least 2 – 3 hours before you cut them. Then, they are best served chilled.